If you review the geologic units listed for Clackamas County, you’ll find many mentions of basalt and other volcanic rocks. Our region lies on the southwestern edge of the Columbia River Basalt Group. 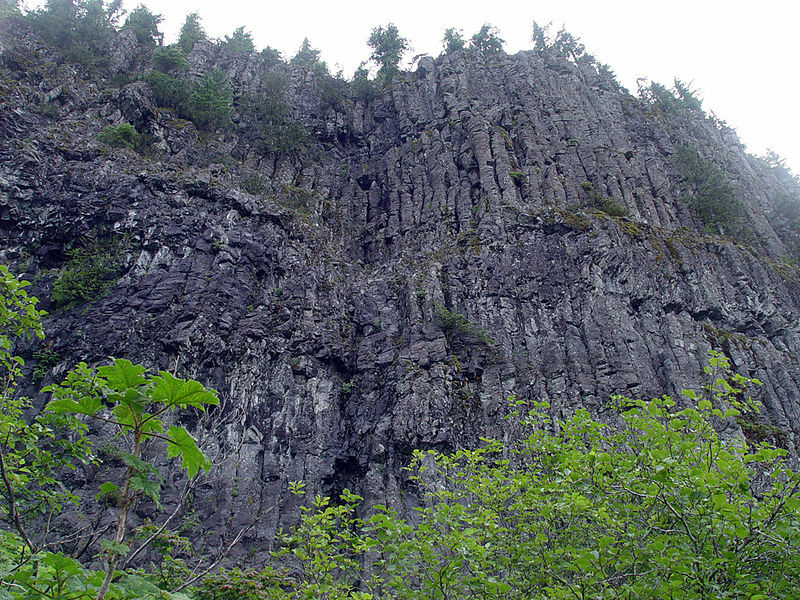 A very common structure seen in Clackamas County is columnar basalt, formed when some forms of lava cool slowly. Basalt is a common extrusive volcanic rock. It is usually grey to black in color, and very fine-grained in texture due to rapid cooling. Sometimes it contains larger crystals, or may show bubble-like voids. Basalt is among the easiest of crystalline rocks that weather to form soils. Soils formed from basaslt tend to be fine-grained. When not excessively weathered, they also tend to provide ample fertility for many plants. 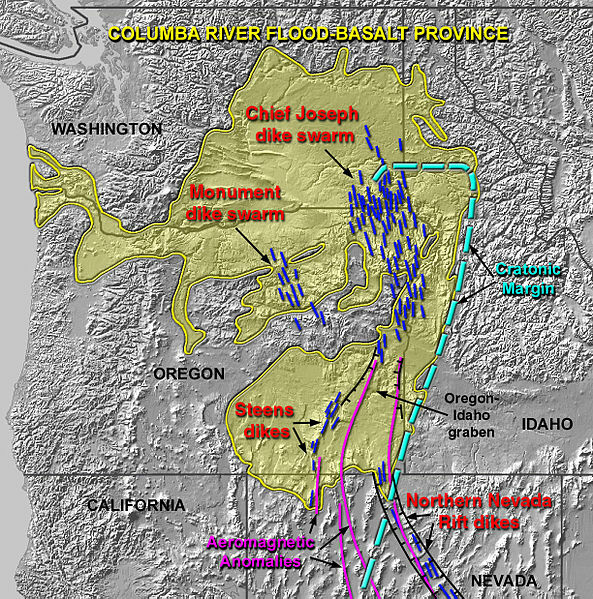 Many people don’t realize that the Missoula Floods of 15,000 to 13,000 years ago also carried large amounts of soil. Much of that soil ended up in the Willamette Valley! Much of the Willamette’s fertility is derived from a series of massive ice age floods that came from Glacial Lake Missoula in Montana and scoured across Eastern Washington, sweeping its topsoil down the Columbia River Gorge. When floodwaters met log-and-ice jams at Kalama in southwest Washington, the water caused a backup that filled the entire Willamette Valley to a depth of 300 to 400 feet (91 to 120 m) above current sea level. Some geologists suggest that the Willamette Valley flooded in this manner multiple times during the last ice age. If floodwaters of that magnitude covered Portland (elevation 20 feet (6.1 m)) in 2010, only the tops of the West Hills, Mount Tabor, Rocky Butte, Kelley Butte and Mount Scott would be visible, as would only some of the city’s tallest skyscrapers…The lake gradually drained away, leaving layered sedimentary soils on the valley floor to a height of about 180 to 200 feet (55 to 61 m) above current sea level throughout the Tualatin, Yamhill and Willamette valleys. Source: Wikipedia.